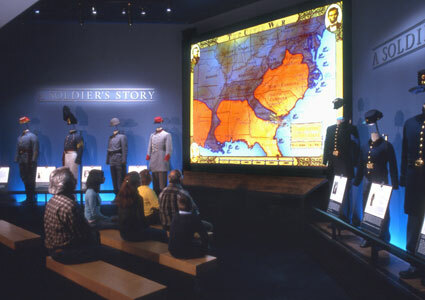 To inform and illustrate the scale, scope and tragedy of the Civil War, the museum’s Civil War in Four Minutes was created. It is a large animated map which plays out the progress of the war with continuously shifting battle lines and flare-ups that mark specific major battles. The entire war is presented in this way in roughly 4 and one half minutes. 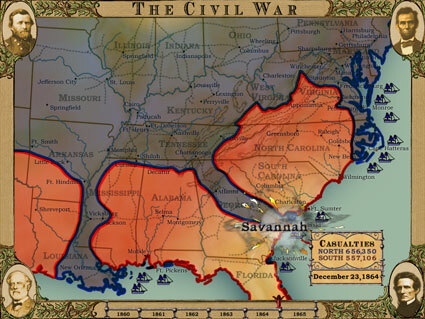 Nothing like this has been done before on the Civil War. The map is of the period and based on meticulous research. The war was broken down into one week time periods and then each week was represented in one second. Storyboards were created illustrating the fluctuation of the battle fronts. Key battles were represented by explosions on the map. The graphic look, information and lay-out was developed and finalized and then digitized to its final presentation format. The emotional effect of all this is both hypnotic and devastating. In the corner of the map, a counter tracks the mounting casualties of this war. The research for this turned out to be a daunting task. It seems that casualty counts are one of the thorny problems of Civil War scholarship. 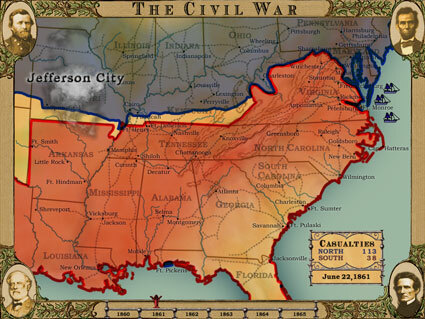 There are many statistics about the Civil War dead and wounded, but they are incomplete, particularly from the Southern side. Existing casualty figures contain statistics that were generally rounded when reporting those who were killed, wounded, missing, prisoners of war, or who died from disease. Weekly totals of battle casualties including disease were needed. The figures had to be as accurate and up-to-date as possible in order to stand the test of time in the museum. 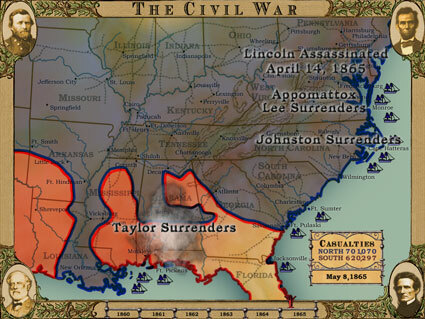 Civil War scholarship is steadily improving in terms of new information. 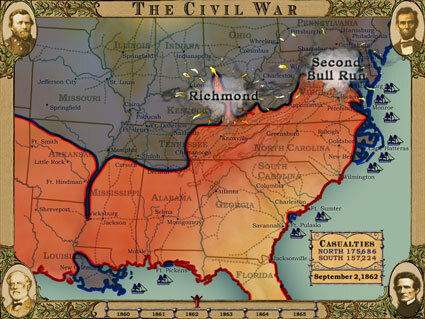 Numerous reference materials were studied, and several Civil War historians were contacted. The biggest battles were the most scrutinized by scholars and their numbers, therefore, fairly well known. There were a few major battles, however, that have been revised due to the diligence of historical researchers. BRC and supervising historian Thomas F. Schwartz, Ph.D., contacted scholars who, over the last twenty years, had been comparing muster rolls with old newspapers for Southern soldiers in the last year of the war. Where investigated, the casualty numbers were generally higher. An interesting exception was Grant’s assault at Cold Harbor, where the casualties were not as high as originally thought. All of this information was taken into the growing database. One of the more creative ways the numbers were manipulated was to take the totals for deaths from disease and average them seasonally over the four years. It was averaged 30% more deaths in winter than summer because of influenza and pneumonia, 35% more deaths the first year of the war before troops were assimilated to new diseases. Numbers were also bulged for particular epidemics such as “the evacuation of Corinth” and the brutal winter of 1862-63. All of this might seem to have been an extreme amount of effort for numbers that flash by with such rapidity. But after speaking to over a dozen Civil War historians and researchers and including their advice in this work, there is great confidence in this representation of an important aspect of Civil War research, which is presented in a compelling and responsible way. Counting Civil War Casualties Week-By-Week. Link to a related page for the PDF download. You can own a copy! 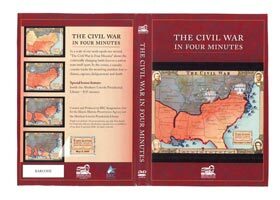 In a scale of one week equals one second, "The Civil War in Four Minutes" shows the continually changing battle lines as a nation tears itself apart. In the corner, a casualty counter tracks the mounting numbers lost to disease, capture, disfigurement and death.